Governor Charlie Baker left the podium after discussing the 2018 budget. 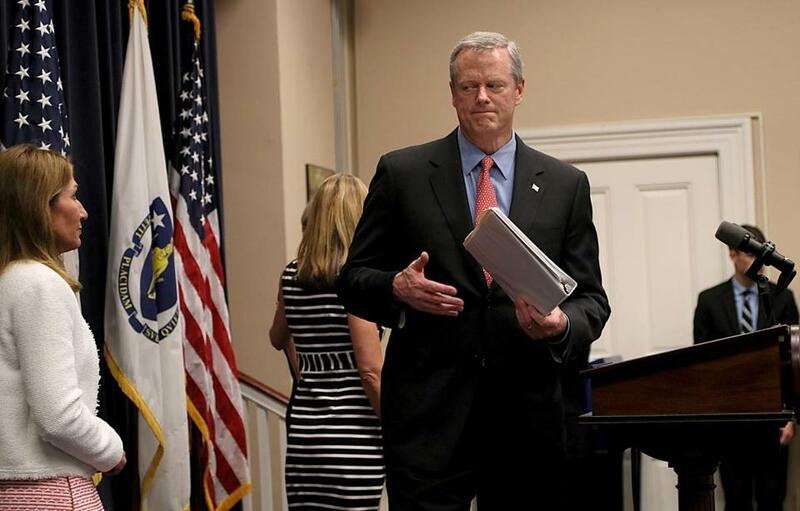 Baker said he expected lawmakers to “deal with” trims to MassHealth spending. Governor Charlie Baker on Monday signed a $39.43 billion budget but urged lawmakers to revisit his proposals to rein in the growth of state health care spending as part of a new fee on businesses. Legislators had passed a $200 million health care fee at Baker’s request but so far have rejected his calls to curb MassHealth spending — prompting complaints from the business community, which does not want to bear the costs of a new fee without promised changes to the program. So Baker wants the Legislature to go back to work. “I fully expect that they’re going to deal with this,” Baker told reporters at a State House press conference. Administration officials said Monday they were asking lawmakers to hold a hearing on the health care proposals within 30 days and send back a final budget within 60 days. If the Democrat-run Legislature does not accept the Republican governor’s MassHealth cost-savings, administration finance chief Kristen Lepore warned, Baker would likely have to pursue other spending cuts below what top lawmakers have already called the most painful funding levels in years. To help fund the Mass-Health program, the governor, the House, and the Senate had earlier agreed to raise $200 million a year from fees on businesses. But lawmakers, in their budget, rejected a complementary set of proposals from Baker to rein in the costs of MassHealth, saying they didn’t have enough time to review his complex plan, which they received unusually late in the budget planning process. Critics slammed a measure that would shift 140,000 low-income people from Medicaid onto commercial insurance plans. Business groups on Monday backed Baker. “We’ve said all along that the assessment is really acceptable only as part of the larger package of reforms. I think the governor sent that message very clearly today, that this is a package,” said Christopher Geehern, spokesman for Associated Industries of Massachusetts, which represents 4,000 employers. Baker also vetoed $320 million in spending in the budget, a move now subject to legislative overrides. The blueprint Baker signed marks a $652 million increase over fiscal 2017 once that year’s books have been balanced, good for 1.7 percent in spending growth, administration officials said. Lawmakers had settled on a $40.2 billion bottom line for the new fiscal year. Deteriorating revenue growth projections forced both the Legislature and governor to curb their initial budgets. The budget Baker signed Monday is based on nearly $750 million less in tax revenues than the baselines used at the beginning of the budget process, Lepore said. She said the new revenue estimate was in line with what a group of economists had agreed upon last month. Senate budget chief Karen Spilka, an Ashland Democrat, said in a statement that lawmakers had “sent the governor a balanced, fiscally responsible budget” despite not having updated financial data from the administration. Senate and House negotiators struggled for weeks to arrive at a compromise budget, deliberations that were complicated both by Baker’s health care proposal, the continuously worsening revenue picture, and uncertainty about big-ticket federal policy decisions still pending in Washington. The fiscal year funded by the operating budget Baker will sign Monday began July 1. An interim budget had kept state government running. Of the 150 outside sections — or policy riders — passed by lawmakers, Baker signed more than three-quarters. He will amend another 25, many health care-related, and veto the remaining nine, most of which dealt with reporting requirements for state agencies. Baker approved language, sought by the casino industry, to extend alcohol service at the gambling palaces until 4 a.m., two hours past what is permitted at the latest-serving restaurants and bars. Baker’s budget message also includes authorization for the state to transfer control of the MBTA employees pension fund into the state’s general pension program, a measure lawmakers have rejected previously. With Medicaid accounting for such a significant chunk of state spending — more than a third — Beacon Hill’s options about where else to tinker with the budget are limited. Baker on Monday imposed about $98.7 million in vetoes unrelated to MassHealth, the business-backed Mass. Taxpayers Foundation said, roughly in line with what he did last year. But how the governor responded to lawmakers’ lack of action on his health care plans has been the budget’s most closely watched storyline. On Monday, the administration asked legislators to reconsider several of those measures, saying they would save an estimated $83 million next fiscal year. Baker’s amendment to the budget calls for re-establishing a “gate” that would ban many low-income people with access to employer-sponsored health coverage from obtaining MassHealth. It would also change eligibility rules and move 140,000 adults, including 100,000 parents, from MassHealth to subsidized private health plans that would include higher out-of-pocket costs. Baker’s plan would also give his administration flexibility to slash “optional” MassHealth benefits. It would issue a five-year moratorium on new health insurance mandates and create another type of health care provider, a dental therapist, who could provide basic care to adults and children. Legislative leaders had signaled they were open to some of the proposals but wanted more time to debate them publicly. In addition to winning over the Legislature, the administration needs federal approval to make several of its proposed changes to MassHealth. Baker vetoed more than $7 million from the Department of Elementary and Secondary Education, and more than $5 million from the Department of Higher Education. ■ A $39.9 million (3.9 percent) increase in aid to cities and towns. ■ $3.5 million for a new State Police division for homeland security, criminal intelligence, and counterterrorism. ■ A $5 million increase for substance misuse programs at the Department of Public Health. Jim O’Sullivan can be reached at jim.osullivan@globe.com. Follow him on Twitter @JOSreports. Priyanka Dayal McCluskey can be reached at priyanka.mccluskey@globe.com. Follow her on Twitter @priyanka_dayal.